This is a healthy fast food, but nonetheless super FAST! Did I mention is cheap? Oh, and one more thing: totally restaurant worthy..! Rinse the fish, put it in an oven pan with some olive oil under it and on top. Clean a clove of garlic, slice it and put it where the guts of the fish used to be, along with some salt and rosemary. Salt the outside of the fish too. DO NOT MAKE CUTS IN THE SKIN. Add a splash of white wine. Cover with aluminum foil and bake for about 10 minutes. 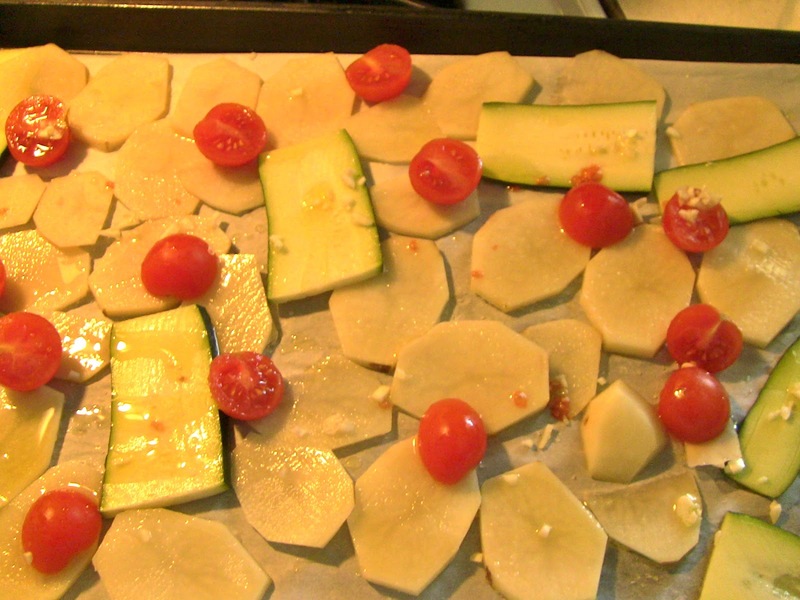 The veggies: slice thinly the potatoes, the zucchini have to be cut a little thicker (so they have the same cooking time as the potatoes and you don't risk burning dinner), half the tomatoes and sprinkle them on top. Salt, oil, the chopped garlic mostly on top of the tomatoes and on the zucchini. TIMING TIPS: put everything together in the oven. The fish will be done before the veggies but you'll have to clean it. With a spoon and a fork remove the skin, remove the meat starting from the center and gently pushing towards the outside, following the direction of the bones. If you use this technique the meat won't have any bones by the time it hits the plate. Trout has very large, long bones, it shouldn't be a problem to spot them. By the time you're done cleaning the fish, the veggies will be done cooking and you can go eat! Serve one side of the fish per person, put it on a plate and with a spoon gather some of the broth at the bottom of the baking pan and put it on the meat. Set some vegetables on the side.